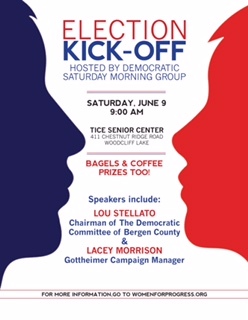 Join us on Saturday, June 9th at 9:00am at the Tice Senior Center in Woodcliff Lake for an election kick-off event hosted by the Democratic Saturday Morning Group! This event will feature speakers including Lou Stellato, Chairman of the Democratic Committee of Bergen County, and Lacey Morrison, Josh Gottheimer’s Campaign Manager. There will also be coffee, bagels and prizes!